_ Overal food security situation of the district is minimally food insecure with all 30 VDCs in phase 1. _ The price of NFC rice remained NPR 33/KG. And the price of major stapels in the market remained normal and unchanged as compared to last year. (price of coarse rice remained between NPR 45 and 48; and wheat flour between NPR 50 and 55). The HHs had a good earning from the sell of livestock and livestock products including fish due to the festival season and also due to the political campaigns for the Constituent Assembly (CA) Election. Many people inmigrated for the Dashain and the CA election with some amount of money as a remitttance. Wage opportunities also remined available through different government and non government organiations. (DDC, DADO, DHO, DEO, KIRDARC, HELVETAS, PAF, HURENDEC). Thus, as a whole, normal price of major food stapels, good earning from the sell of livestock & livestock products, available wage opportunities and the remittance as resulted to normal access to food. _ All 30 VDCs of the district have been declared ODF and 80% of the HHs have access to clean drinking water due to the regorous effort from different GOs and I/NGOs. The prevalence of acute malnutrition rate is 7% as an impact of child grant, school feeding program, and fortfied flour distributed by DHO. No records of diseases and epidemics were recorded during the cycle. And hence the tilization remained normal. _ No incidents of climatic hazards and civil insecurity were recorded. _ Improvement in diversified food was observed as the availability to vegetables and milk products is better during the summer season. _Coping remained normal as a result of normal availability, accessibility, and utilization of food; and as a conclusion the district remained minimall food insecure. 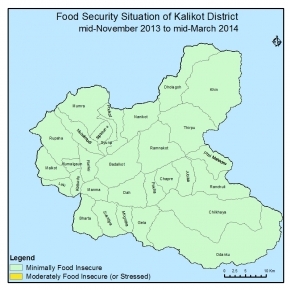 _ The overall food security situation of the district will remain minimally food insecure. _ The HHs will have remaning food stock from the good harvest of summer crops. _Market food stock is expected to remain sufficient with the proper functioning of the karnali Highway. _People will start inmigrating from India with some remittance. _ Development activities are expected to speed up in winter and dry season. _ Blacktoppping work of the Karnali Highway will resume. _ Road construction work by DRILP and RAP will start. _There are less c hances for natural disasters and hazards during the winter and dry season.